In the best sense of the word, Brad Scruggs, Ahmad Saleem and Brian Scruggs are taskmasters. 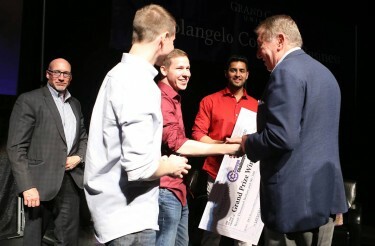 Grand prize winners of the 2015 Canyon Challenge (second from left), Brad Scruggs, Brian Scruggs and Ahmad Saleem, are congratulated by judge Jerry Colangelo. The recent biology graduates of Grand Canyon University put medical school on hold six months ago to jump aboard an international phenomena fueled by the popularity of Uber, the mobile-app-based transportation service. They created a software application that matches people who need tasks done sooner rather than later with people who have the know-how, desire and time — now — to do them and launched Joblyt. 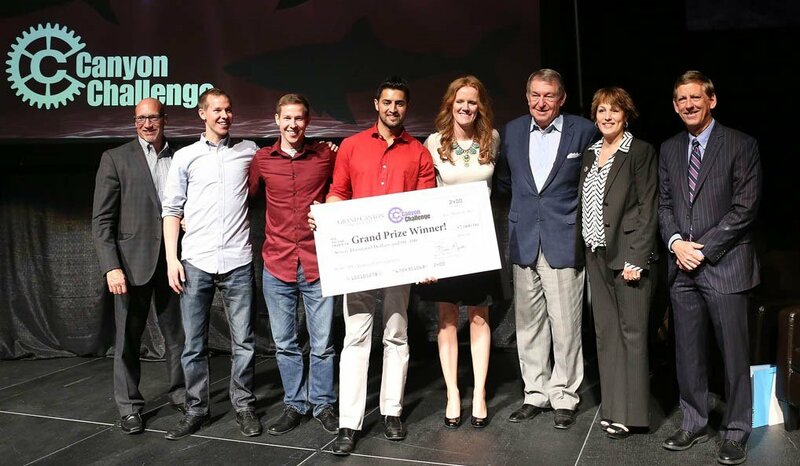 The young entrepreneurs needed funding, and they got it Tuesday when the judges selected Joblyt the grand prize winner of the 2015 GCU Canyon Challenge, which was hosted by the Colangelo College of Business before an estimated crowd of 400 in GCU Arena. The Scruggs brothers and Saleem, instructional assistants in the College of Science, Engineering and Technology, received a $7,000 check for first place plus $4,000 more for nabbing 49 percent of the votes in a 20-hour texting campaign drawing nearly 5,200 voters. That’s 11 grand that goes, you guessed it, back into the business. It will work this way: You need a broken, behemoth television set removed from your garage and hauled to a recycling center, but have neither the muscle power nor the truck to do the job. You download the Joblyt app, input your request and are contacted directly by someone who does have the strength and the wheels. You can do background checks, and you pay on the secure website. The list of tasks — car washing, house cleaning, lawn mowing — is endless and, with 20 GCU interns already in place, so is the Joblyt talent pool. GCU nursing student Victoria Saunders presents her idea to judges, from left, Sheldon Harris, Lauren Bailey, Sandra Watson, Jerry Colangelo and Brian Mueller. 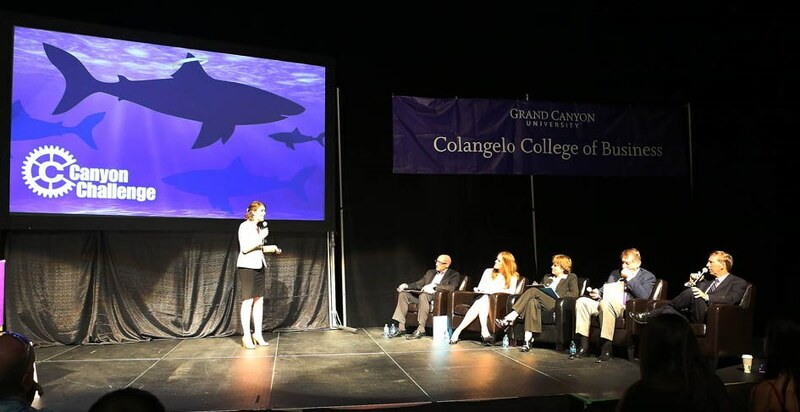 And that’s what the judges at the fourth annual entrepreneurial competition, including GCU CEO/President Brian Mueller and Phoenix business icon Jerry Colangelo, for whom the University’s business school was named last fall, liked best. Mueller praised each of the finalists, and drew a parallel between selecting the grand prize and second- and third-place winners and being a parent who has to pick his or her favorite child. 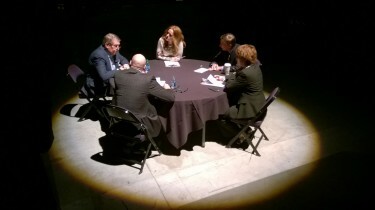 That potential for job creation was another plus noticed by the judging panel, rounded out by Lauren Bailey, co-founder of Upward Projects, Sheldon Harris, CEO of Coaching International, and Sandra Watson, president and CEO of the Arizona Commerce Authority. The Scruggs twins and Saleem earned $11,000 in two prizes for their business idea, Joblyt. Saleem, who chose to attend GCU because of its leadership and growth, said connecting “task creators with task completers” was his idea. But it was the Scruggs brothers’ success with their YouTube sensation, FIFA TIPZ, in which they advised players how to beat the video game, that brought them together. “They were very personable (on YouTube), and there’s no better way to connect than being personable,” Saleem said. Master of ceremonies Tim Kelley, an assistant professor in the Colangelo College of Business, is joined by Thunder and student Geoff Breed, winner of a $1,000 prize at Tuesday’s Canyon Challenge. The competition, held in a semi-darkened GCU Arena with lights, cameras, action and music, had a more glitzy, fun, interactive atmosphere than in past years. Mueller credited Dr. Randy Gibb, CCOB’s dean, and Tim Kelley, assistant professor of entrepreneurship and economics in the college, with ramping up the event. “The organization and professionalism of this went way up. This was fantastic, and I can see it growing into something that will fill this Arena at some point,” Mueller said. Another feather in Canyon Challenge’s briefcase was the student body support. The Canyon Challenge drew 79 entries from students, prospective students and employees, a field that over several months was narrowed to 10, then to five. 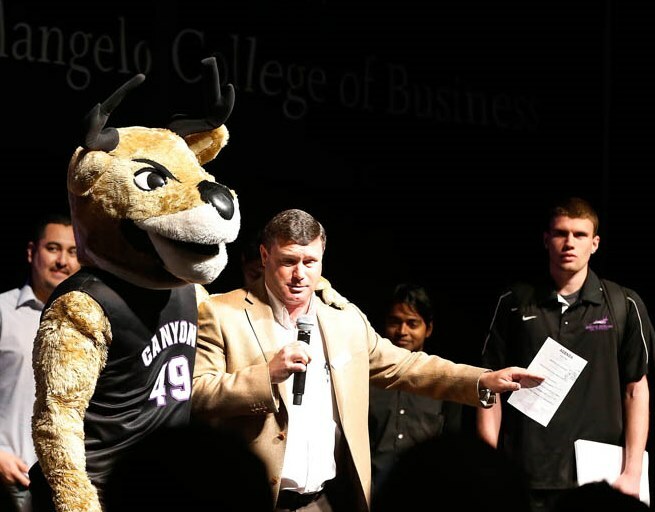 Kelley, the master of ceremonies, thanked the 15 other individuals who handled judging duties earlier in the year and GCU’s executive team and IDEA (Innovation, Development and Entrepreneurship Association) for supporting student entrepreneurship. He explained the Canyon Challenge rules — think television’s “Shark Tank” only, as Kelley quipped, “We’re not sharks here, we’re angel sharks” — in which each finalist was given five minutes to present his or her business plan, followed by five minutes to answer questions from the judges. This year’s competition also had more financial backing, thanks to 11 sponsoring companies that donated $15,000 in prize money. A $2,000 prize was awarded to the second-place winner, Prayer Packages, owned by Daniel Black, a GCU senior majoring in entrepreneurial studies and his wife, Tiffany. The Christian gift company sells a variety of gift boxes containing personalized cards, inspirational wristbands and prayer tokens, blankets, journals and Bibles for a variety of occasions. The judges were impressed by the company’s $9,300 in gross sales during its first 10 months in business as well as its future earnings potential and pretty packages, too. Each judge received one from the couple during their presentation. Third place and a $1,000 prize was awarded to EpiFinder, diagnostic software that is being tested by physicians at Mayo Clinic and Phoenix Children’s Hospital, among others, to more efficiently diagnose epilepsy and other diseases. GCU senior Harsh Patel, a CCOB senior majoring in applied management, is part of the EpiFinder team assembled by founder Robert Yao, who is working on a Ph.D. in biomedical informatics at Arizona State University. Rounding out the five finalists was the Eddie Bear Book Series, created by Victoria Saunders, a student in the College of Nursing and Health Care Professions, and Smart Business, owned by Dr. John DenBoer, a neuropsychologist who assesses GCU athletes. Additionally, $1,000 was awarded to “Smash Ball” entrepreneur Geoff Breed, a sophomore sports management major, during voting before the Canyon Challenge began. Arena visitors were able peruse 10 products, from Mexican-style popsicles to longboards, and vote for their favorite. Breed said he hopes to host a soccer game on GCU’s campus for students who would be able to take turns wearing the Bubble-Wrap-like products, 3-foot-tall plastic balls, to safely run around the field in a competition. 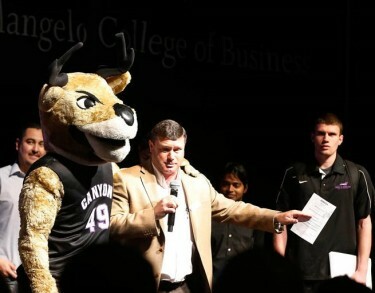 It was the first Canyon Challenge for Gibb, who was named dean in July. On Tuesday, Gibb already was thinking of ways to build on its momentum by perhaps involving faculty and students at the state’s public universities. Sponsors of the Canyon Challenge were Barnes Investment, Bruce Peterson Investments, Coe & Van Loo Consultants, CopperPoint Mutual, Federated Insurance, JDM Partners, Lane Terralever, National Bank of Arizona, Position Sports, Well Kept Wallet and Wells Fargo.